Harvard University’s Ash Institute for Democratic Governance and Innovation selected the Idaho Department of Water Resources program, “Mapping Evapotranspiration from Satellites,” as one of the Top 50 programs in the 2007 Innovations in American Government Award competition. 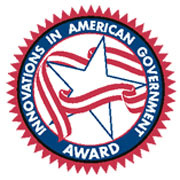 The Innovations Awards is an annual competition sponsored by the Ash Institute, which is part of Harvard University’s John F. Kennedy School of Government, to recognize significant innovations at all levels of government in the United States. The Ash Institute chose IDWR’s program as a Top 50 program from a group of nearly 1,000 applicants. Evapotranspiration (ET) is water that is transpired from the leaves of plants and evaporated from the soil. ET from irrigated agriculture consumes over 90 percent of the water used in Idaho. ET data are crucial for water conservation, planning, and administration, because it represents the amount of water consumed by irrigated agriculture and other land uses. The program provides accurate and repeatable ET data and maps for water resources management in Idaho. IDWR’s program is innovative because it uses a satellite-based model called METRIC (Mapping EvapoTranspiration using high Resolution and Internalized Calibration) that is based on digital images from the Landsat satellite to compute and map ET. The METRIC model is up to 96 percent accurate over a full growing season, and can replace more expensive methods of monitoring water use. IDWR teamed up with the University of Idaho in 2000 to develop, test, and apply a satellite-based method for computing and mapping ET in Idaho. Over the last seven years, IDWR and the U of I have developed a suite of important water resource applications based on ET data developed with METRIC. IDWR’s program uses Landsat satellite images to compute and map ET because it is the only operational satellite with a high enough resolution to map ET within individual fields and because it has the required thermal band. In spite of the demonstrated importance of the Landsat thermal band for water resource applications such as ET, the next generation of Landsat satellites in the Landsat Data Continuity Mission is not scheduled to have a thermal instrument. This entry is filed under News.